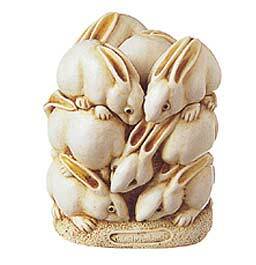 A group of gentle bunnies pile on top of one another in neat rows. This piece was inspired by Japanese netsuke and is therefore more symmetrical than other box figurines. The mouse is hidden between two bunnies’ hind legs and later a carrot was added. There are no inner carvings or inscriptions. Interior hallmarks include the HBC logo, and P. Calvesbert is inscribed on the base.